1. 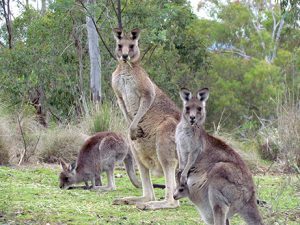 Demand an end to the cruelty of kangaroos in NSW! ‘The RSPCA’s research shows commercial shooters have lifted their accuracy rates from 86 to 96 percent. I/WE DEMAND AN END TO THE CRUELTY OF KANGAROOS IN NSW! NSW kangaroo management is unacceptable to any compassionate and moral Australian citizen, and it just got worse. In June 2018, the NSW Liberal/National government ‘relaxed red tape’ with regard to the already under-regulated and inhumane system of private culling of kangaroos in addition to a huge commercial hunt across the state. This unethical political appeal to some NSW farmers also recruits city shooters to kill kangaroos in a totally unmonitored program. More kangaroos than ever are being maimed before death and unweaned joeys at foot left to starve. In the commercial industry hundreds of thousands of kangaroos suffer face or body shots annually before being finally killed (RSPCA statistics). The non-commercial ‘less professional’ killing, promoted by NSW Primary Industries, now with even less conditions, is unacceptably inhumane. Here is an eyewitness account from NSW landowners who have witnessed commercial hunting along their property line for nearly a decade. ‘We have seen hundreds of kangaroo’s heads that have been butchered and left in the field. Many do not have a gunshot wound to them…. We have witnessed kangaroo heads that have been shot in regions of the head other than the brain case, often in the front of the head, [these kangaroos] may not have died until sometime after, often showing the signs of gruesome secondary trauma from a length of metal pipe or an axe. The nature of kangaroo hunting and culling for economic purposes is inherently cruel to individual animals, destroys the kangaroo presence in natural ecosystems and bloodies our national icon, shaming Australia in other countries. We are among many citizens who say it has to stop and will vote for reform of wildlife management. We have designed a postcard to be sent to local and state representatives. We hope to distribute these throughout NSW. Please donate to printing costs and advertising the campaign. Please fill in a form so we can send you tax receipt. All donations over $2 are tax deductible!